Want to keep your house comfortable year-round while protecting the attic and roof from a battery of hazards? An attic fan may be just what you're looking for. It’s midsummer, and for hours and days, sun has been beating on the roof of your home. Measurements have shown that, given the right weather conditions, typical roofing materials can reach up to 150 degrees Fahrenheit. That heat eventually transfers from the outside of the roof to the sheathing. From there, it penetrates the insulation and roof framing materials, raising the temperature of the attic to a precarious extreme. But summer isn’t the only season during which the attic faces a threat. In winter, when windows are shut tight, there’s considerably less ventilation for the humidity generated by cooking, laundry, and showers. With nowhere else to go, that moist air accumulates in the attic, where it can bring about a battery of risks. Indeed, no matter the time of year, there are good reasons to give extra attention to your attic and the stresses that it undergoes. A blisteringly high attic temperature isn’t uncomfortable only for the unfortunate soul standing in the unfinished space. If it goes high enough, the temperature in the attic can influence other rooms and make them hotter. Such inefficiency forces the air conditioning system to work harder than would otherwise be necessary, and of course, you must pay for that extra effort when the energy bills arrive every month. Beyond the extra cost, trapped heat and moisture can end up doing real damage to your home by fostering mold growth. In extreme cases, excess moisture can even rot away portions of the key structural framing found in the attic. Another possible consequence of runaway attic temperatures: The most common types of shingles—asphalt shingles—are plenty capable of withstanding heat when it comes from the sun. But when heat comes into contact with their undersides, those same shingles can fail prematurely. Fortunately, there’s a straightforward solution to heat and moisture problems on and under the roof. For money savings, a more comfortable home, and reliable protection for your roof (both its structure and shingles), consider installing an attic fan. Designed to reduce both heat and moisture, a roof-mounted attic fan operates by a simple principle. The fan pulls warm air out through a roof vent, drawing in cooler outdoor air through existing vents located along the soffits (on the underside of the roof overhang). That exchange of stale, warm air for fresh, cooler air relieves the added pressure that had been put on the air conditioning. Now, the system can run more efficiently—and you can pay less on your monthly utility bill. In the past, attic fans were always hardwired into the home and powered by electricity. Many homeowners saw that, while the attic fan may have been saving them some money, those savings were being erased by the cost of installing and operating the fan. Thanks to industry innovators like Solatube International, Inc., that’s no longer an issue. 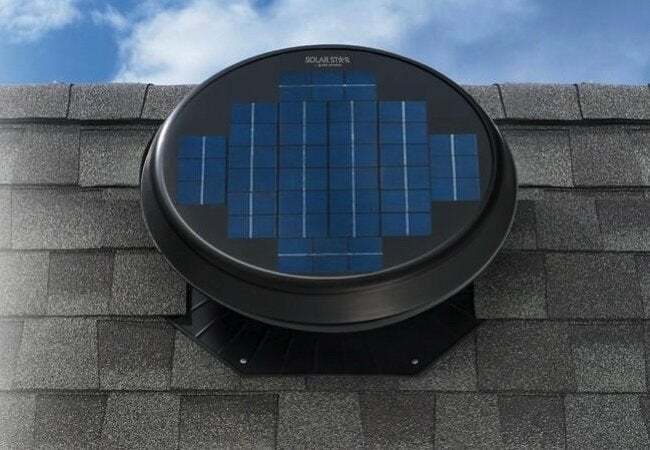 You can now keep all your savings by installing the Solar Star attic fan, which runs not on your home’s electrical system, but on free and abundant natural sunlight. Even as it keeps your attic cool and dry, the Solar Star requires no hands-on operation or maintenance. In fact, it’s likely that you’ll never even notice it’s running. For one thing, Solar Star has been designed and manufactured to resist everything nature might throw its way, from wind and rain to snow and hail. 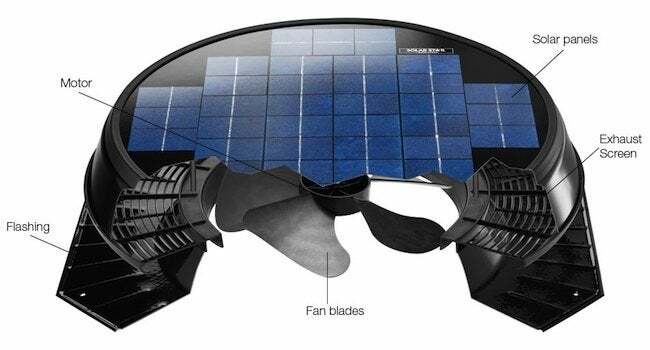 Its power source—a series of small photovoltaic panels—is located right on the exterior cap of the fan. Made of durable composite, the cap reliably shields the more vulnerable components, ensuring powerful ventilation year-round. The brushless motor and lightweight, noncorrosive fan blades work in concert to keep the operating noise level down to a whisper. While you may not be aware of the fan’s operation, you’re very likely to notice the benefits of having chosen Solar Star to regulate your attic temperature. Solar Star only becomes more effective with its add-ons. One such option is a thermal switch that automatically activates the fan once the attic temperature reaches a certain threshold. A similarly handy extra: If you live on a shady lot and worry that Solar Star won’t get enough sun to operate throughout the day, check out the add-on solar panel. An ingenious solution to the problem of tree cover—and for that matter, cloud cover—the supplemental panel can be placed on the sunniest part of your roof to ensure continuous operation. It’s ironic: Problems caused by the sun—ranging from mere discomfort to devastating damage—can be solved with a Solar Star that relies on the sun! While most discussions of attic fans tend to focus on their summertime benefits, ventilation can be critically important in winter too. After all, that’s when the moisture created by the humdrum events of daily life—showering, for instance, or doing the laundry—rises up through cracks and gaps only to wind up in the attic. If trapped and unable to vent, attic moisture can invite the growth of mold, or cause damage to insulation and framing. There’s also another less obvious but more potentially destructive problem—ice dams. The attic space is usually warmer than the outside, or roof, temperature. 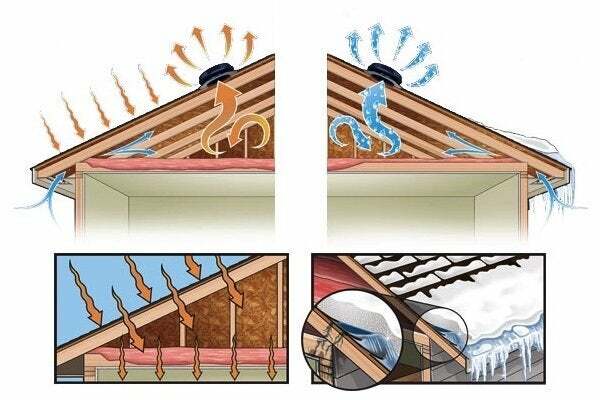 This heat transfers through the roof structure and can melt snow accumulated on the roof. From there, melted snow trickles down until it reaches the eaves. Because the eaves do not come into contact with the attic space, they are colder and cause the melted snow to freeze. This forms an ice dam, a ridge of ice near the edge of a roof, adjacent to the gutters. Later, when more snow melts, the ice dam prevents the water from running off the roof. With nowhere else to go, it can get behind the shingles and cause an extensive, expensive leaking and roof damage. Because Solar Star equalizes indoor and outdoor temperatures, it can counteract the formation of ice dams as well as protect the home in myriad other ways. For maximum effectiveness, a Solar Star attic fan must sized to supply adequate ventilation for the space. How much ventilation does your house need? That depends on the size of your attic. Solar Star attic fans come in two sizes and can be installed in multiples to meet ventilation demand. The RM 1200 model works best for small attic spaces in moderate to mild climates. The more powerful RM 1600 makes a better choice for large attics and less temperate, more extreme climates. • The sleek and unobtrusive low-profile mount is ideal for most pitched-roof applications. • If a roof accumulates a great deal of snow, go with the high-profile mount, which raises the solar panel and fan well above the roof plane. • The pitched-roof mount orients the solar panel to maximize exposure to the sun. Indeed, with attics of any size or roofs of any profile, there’s a way for Solar Star technology to provide powerful, effective ventilation. 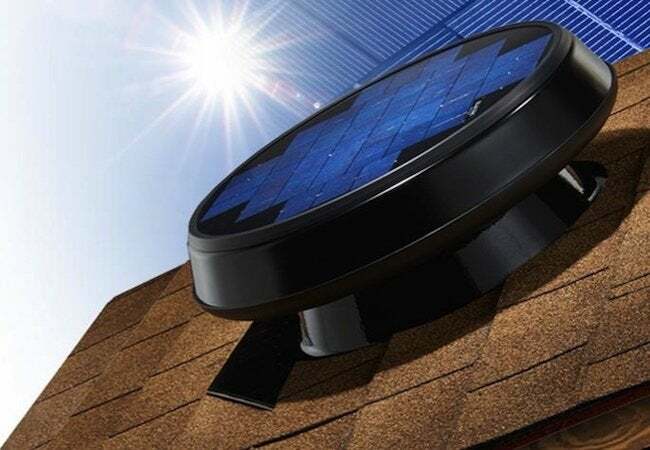 And it’s well worth mentioning that if your attic already happens to be fitted with a passive vent, you can turn it into an active, solar-powered ventilation system with the IM 1200. Unlike the others in the Solar Star line, the IM 1200 mounts indoors, directly behind the passive vent opening. Whatever your needs, Solar Star can match them. Accurately sized and properly installed Solar Star ventilation can trim your energy bills by as much as 25 percent. Also remember that until 2016, the federal government is offering a 30 percent tax credit for systems that rely on solar photovoltaic technology. Consider those savings alongside what you stand to save from month to month. Right now seems like a fine time to start protecting your attic and roof from year-round stresses, while also enhancing your family’s comfort!